Did you buy an NVIDIA SHIELD? Do you wish you hadn’t? If the answer to those two things is a resounding “Yes!” then you may be very pleased to learn that there is a brand new killer app on the way that will make that SHIELD seem like a great idea. And that’s no mean feat. 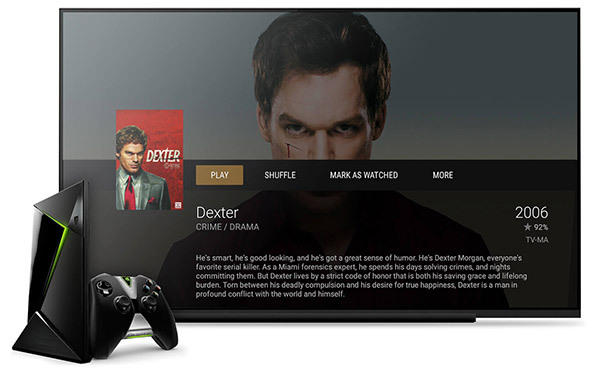 The app we are talking about is Plex, the ever-popular media management and playback application, which today announced that an upcoming update to the app will add support for the – you guessed it – NVIDIA SHIELD hardware. Those who don’t have a computer or NAS that can do the job of acting as a Plex server can now repurpose their SHIELD to do the job instead, and the best part is they won’t even need any additional hardware in order to make the magic happen. In fact, the team behind Plex claims that the device runs their app better than any other and that it will be able to run the full media server with all its features, including hardware transcoding, which is a huge plus for those who take their multimedia setups seriously. Launched last May, both the standard and Pro versions of the NVIDIA SHIELD are supported, according to Plex. With a 64-bit CPU and a beast of a GPU in Tegra X-1, and support for 4K video playback at up to 60fps, NVIDIA’s SHIELD might actually be a pretty good option for anyone looking for a small, quiet media server to call their own. The Pro version even comes with 500GB of storage, though that kind of space soon disappears when you start filling Plex with media. But the great thing about NVIDIA SHIELD is that it offers support for plugging in external USB drives, which means you can buy a large USB drive and connect it to your SHIELD to turn it into the ultimate server+client box! The updated version of Plex is set to arrive some time in June, so those with NVIDIA SHIELD hardware desperately waiting for a killer app to run on it shouldn’t need to wait too much longer. If the Android TV-powered SHIELD doesn’t float your boat, though, Plex has said that the company is working on bringing its media software to other platforms in the future too, so keep your eyes peeled for further news on the matter when we have it. If you are interested, you can grab NVIDIA SHIELD 16GB from Amazon right now for as low as $179. This piece is great! I got one and it already works perfectly. Plex is my favorite solution for streaming movies from my computer and now it will get better. Great news indeed. I really don’t understand the regreting buying a shield comment? this is the best android box by far that I have ever tested or owned, and I have so with at least 30 different ones.